Recorded 1889-1959. 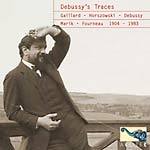 First publication of recently discovered lost recordings! For too long, Brahms has been damaged as a sacred cow mounted on a pedestal. 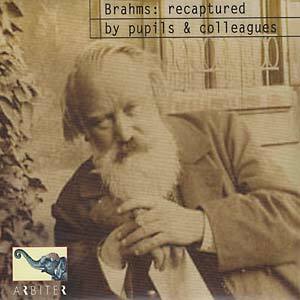 Arbiter's newly discovered live and private performances allows all to closely approach Brahms, including a funky improvisation by the composer himself from 1889 -- witness a style more Harlem than Hapsburg. 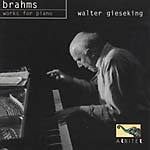 Nearly all the musicians heard here were in contact with Brahms and play his works as new music; jazzy, as if created on the spot. His lost language is fully revealed here for the first time through their sounds and words. Brahms's pupil Carl Friedberg, who appears here, even taught Nina Simone, who carried on their tradition. Extensive recorded excerpts from Friedberg's lessons to Bruce Hungerford are accessible on Arbiter's website; a duo performance by Friedberg and Hungerford is included here. 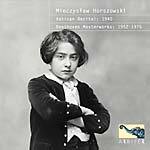 Performers include pianists Johannes Brahms, Carl Friedberg, Edith Heymann, Marie Baumayer, Ilona Eibenschütz, and Etelka Freund; and the Trio of New York with Friedberg, piano; Danil Karpilovsky, violin; and Felix Salmond, cello. Composers include Brahms, Chopin, Schubert, Beethoven, Schumann, Bach, and Bartók.